Whee! All The Way Home: Evil Plot or Oversight? I do miss you, you know. The dreams in which I stand, drink in one hand and Salem Light in another, still come from time to time, but our break-up remains on solid ground in real life. That's why it's kind of funny to actually find myself on your side of anything. But here I am, having cast a vote against Proposition 29. I buy into the point of view you espouse that we're really not in need of yet more governmental bureaucracy. And the fact that the tax money can be spent outside of California seals it. I realize that makes the pro-Prop 29 people sad. Sorry. I'm sorry, too, that I'm going to now offer up a way for Big Tobacco to easily get this thrown out if it happens to pass today. In Marin County, there are examples of how to vote. 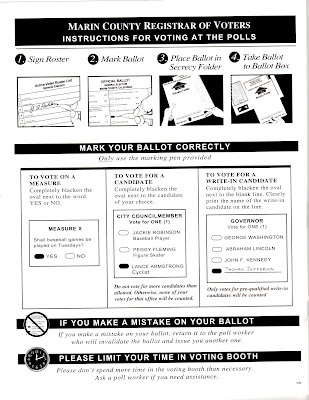 These examples are in the Voter Information Packet and Sample Ballot they sent out. They are also posted, big and bold, in the voting booths. I know that because I did the unusual thing and voted in person today. I took Youngest with me and I even let him have my "I Voted" sticker. This is what was in the ballot and also in the voting booth. Who is one of the biggest proponents of Prop 29? Who has put a boatload -- or a bikeload, I guess -- of his own cash into the fight? Who is Marin County Office of Elections telling me to vote for?